One of the joys of teaching courses encouraging others to write blogs is that – without exception – the participants always come up with wonderful ideas and here are just a couple that have been spawned as a result. The next course HOW TO WRITE A BLOG THAT PEOPLE WILL WANT TO READ will be held in Spitalfields on 11th & 12th October. It can be difficult to pinpoint the exact moment a decision is made. The impulse is hardly felt, the impetus slowly grows, things start to be done. Small and large. Large is booking the flight to go to look at properties, then back at home instructing an agent to sell our flat. Small are the acts of tidying, sorting, organising, beginning to make it all possible. 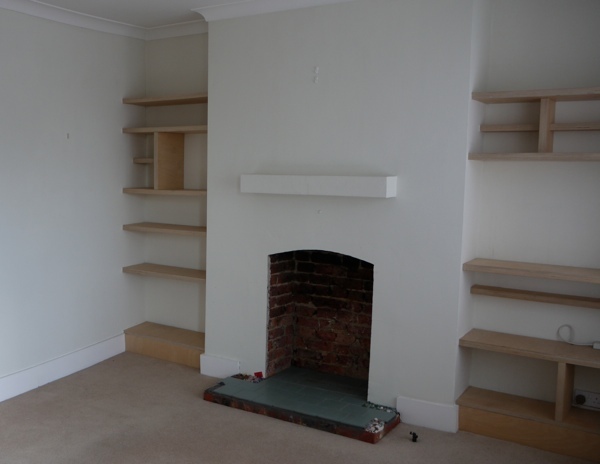 Harder still is to explain why having loved London for thirty years, why having only months earlier completed the improvements to our flat that we had waited thirteen years to be able to afford to make, and having relished them for only weeks, we suddenly wanted out, both of us. Out of London, out of jobs (my husband’s – I’m a freelancer and I shall keep on doing mine). This is the beginning, and while nothing irreversible has taken place in reality, something irreversible has taken place in our hearts. 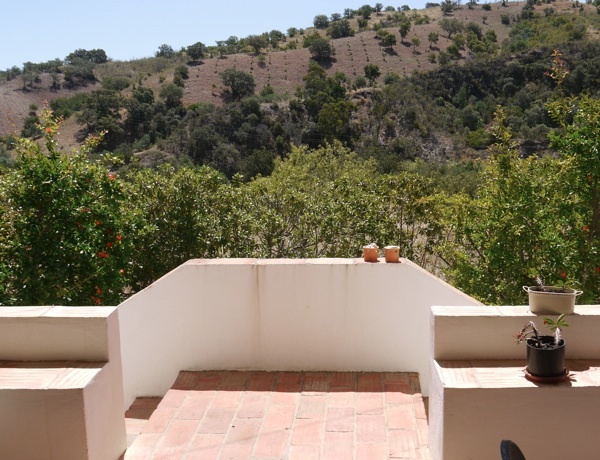 In a matter of months, all being well, we will have sold our flat and moved into a house in the eastern Algarve, in southern Portugal. My husband will have given up his stressful but quite well paid job in publishing, and will be baking bread. I will support us through my work as a freelance editor, which I hope will survive the translocation intact. As it is, I have worked with people for years in the same city whom I have not yet met, so can it make much difference if I’m further away? This will be the story, week by week, of how it all happens. I’m typing this sitting on the floor of an empty flat. On Wednesday evening our solicitor phoned us to tell us contracts had been exchanged. Confirmation in writing came on Friday. On Thursday, Husband made it with my help to his office where he delivered a leaving speech while leaning on crutches and with the additional support of a wall. He was very happy to be able to say his goodbyes. On Saturday he and I travelled by train to my mum’s house, a bungalow – what joy! – where he will convalesce, then I returned to London. I now had thirty-two hours before the packers arrived. I managed to work for twenty-four of these hours. Last week on his way home, Husband had an accident on his moped, caused by a cyclist running a red light. Superficially it didn’t seem a bad accident. No harm done to the moped anyway. However, in attempting to avoid the collision with the cyclist and then self-correct, Husband shot out a foot, which met the tarmac, sending severe forces up to his knee and fracturing his tibial plateau. 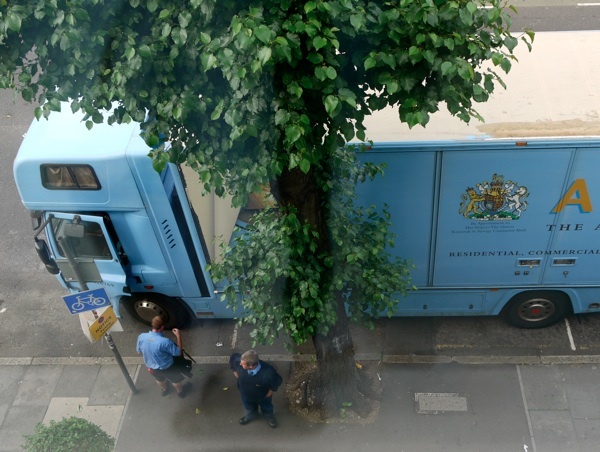 He was taken by ambulance to University College London Hospital. Three days later – that is, last Friday afternoon – he had an operation to insert a metal plate to hold the knee together. At 5pm I phoned up. The woman who answered couldn’t help, but assured me that Ron, Husband’s nurse, would call me right back. By 6.30, no return call. I’m not an especially panicky person, but I did think that Husband might be dead. They wouldn’t want to give you that information over the phone, would they? I decided to go in. I arrived at the ward and saw the empty space where Husband and his bed had been. The first person I asked wanted to be helpful but didn’t know anything about Mr G. The second person couldn’t help either but told me to talk to ‘Ron.’ Ron was busy with a patient and so I waited, stricken. Finally, Ron had done all he had to do there and peeled away. I tried to intercept but a woman sitting by a man in the next bed got in first and called out to him, ‘We asked for tea half an hour ago.” Ron promised to see to this. 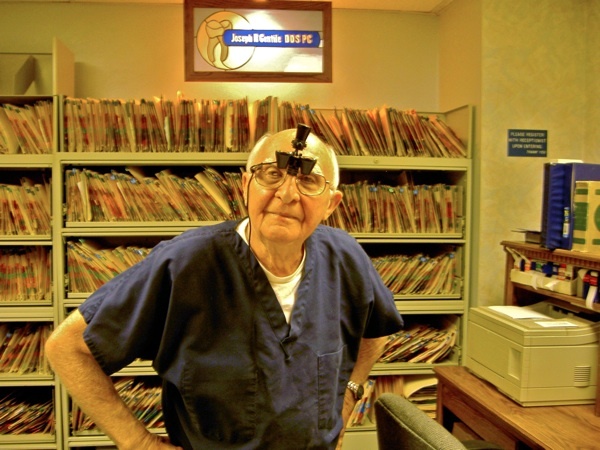 “‘I can only bring up one patient at a time,” said Ron narkily. This told me that Husband is alive! He wouldn’t have said that if he was dead. I returned to the ward and there was Husband, looking fine. A little spaced out, a little pale, but fine. In my handbag I had some slices of his latest home made bread, which had been in the freezer. He ate it like a hungry lion. All will be well. Just eight weeks of first-stage recovery to get through. In 1997, nearly five million bits of Lego fell into the sea when a huge wave hit the container ship Tokio Express, washing sixty-two containers overboard. 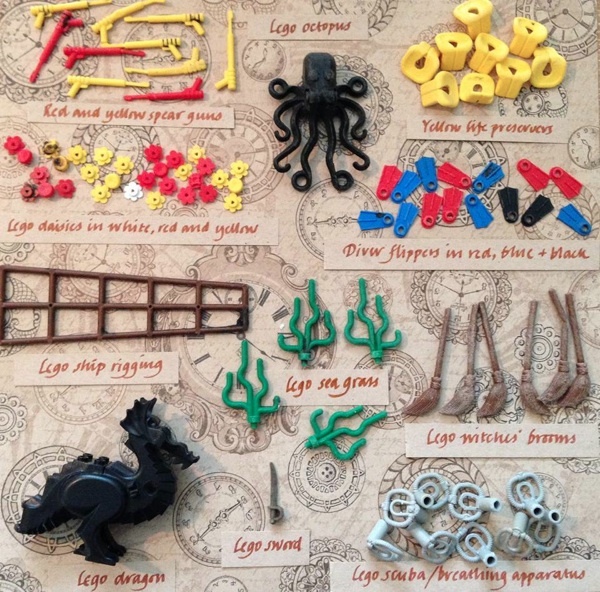 Beachcomber, Tracey Williams, first discovered pieces of sea-themed Lego on beaches around her family home in South Devon in the late nineties. 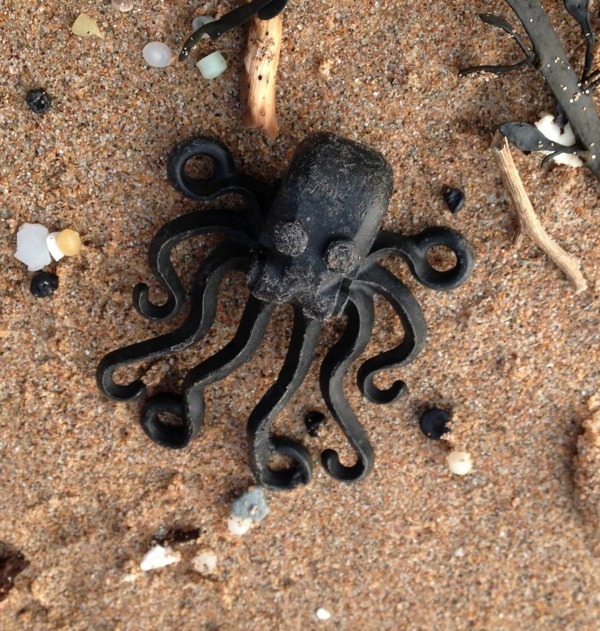 She now lives in Cornwall, where the shipwrecked Lego still washes up daily. 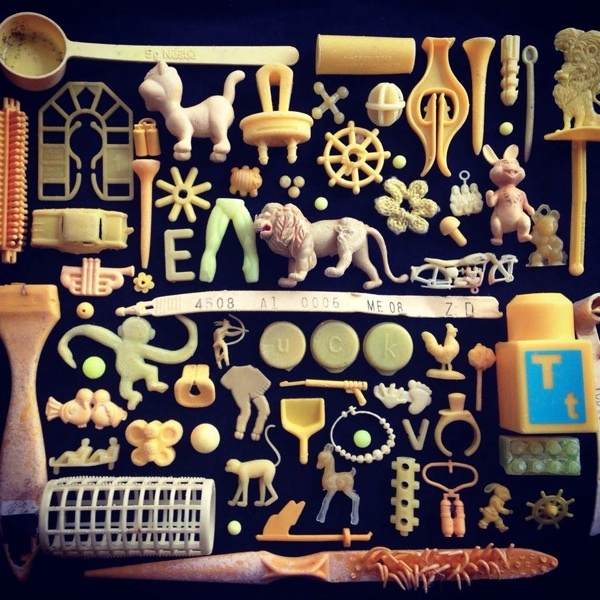 Here’s a photo of some the different types of Lego that were in the containers that fell off the Tokio Express. If you find any, please let us know as I’ve been told that it all needs to be reported to the Receiver of Wreck and it’s probably easiest if I do monthly reports for them rather than everybody reporting each individual daisy (and there over 350,000 of those) individually. I’ve been living in West London near the Thames for many years. A comfortable trot takes me to the water’s edge in five minutes or so, and a walk along the towpath to commune with the waterfowl is a wonderful antidote to all the hours spent at the computer. 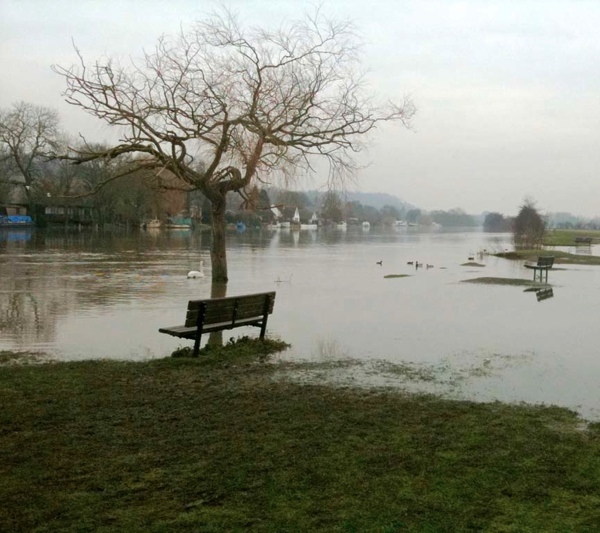 But now the Thames has burst its banks at Chertsey and Datchet, not all that far away, and the latest BBC news was mainly about waterlogged houses, sandbags and tired volunteers. Not a word about when, or whether, that unholy amount of water will roll down to these parts. So here I sit, wondering what to do. When I first moved here, a message arrived from Hounslow Council. It instructed me, in the case of flooding, to go upstairs with radio and kettle and wait for instructions. A telephone number was also given, with “Monday to Friday, 9 to 5″ in bold print.“There will always be an England,” I thought. Flood, what flood? I hope not to find out now. The Thames is tidal here, and continental visitors used to the unchanging flow of the Seine in Paris or the Rhine at Cologne get quite upset when they see the Thames turning in a few hours from a grown-up river to a muddy trickle. Ebb or flow, I know and love it so well, complete with gulls, Canada geese, moorhens, ducks, swans and cygnets. During a long illness many years ago, when I was practically housebound, this path was my only escape from a tiresome, demanding therapy – it saved my sanity with its perpetual motion and shimmering beauty. Ever since, a kind of love affair has been going on between the river and me. Back to the flooding. The huge, elegant and murderously-expensive houses along the river protect their front gardens with tall walls – the flotsam and jetsam of a high tide reaches those walls with ease. I stop for a moment under one of the old weeping willows that leans towards the water. It is used to having its roots washed regularly, but will it survive a total immersion? 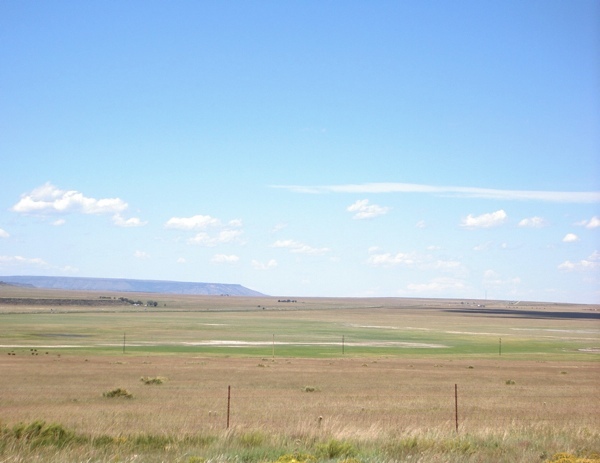 Will we, living on this flood plain? Shall I have to go upstairs with kettle, radio and my old wellies, waiting to be rescued no longer only between 9 and 5, Monday to Friday? Frankly, I am scared. “”Sweet Thames, run softly, till I end my song” and beyond, too. Please. 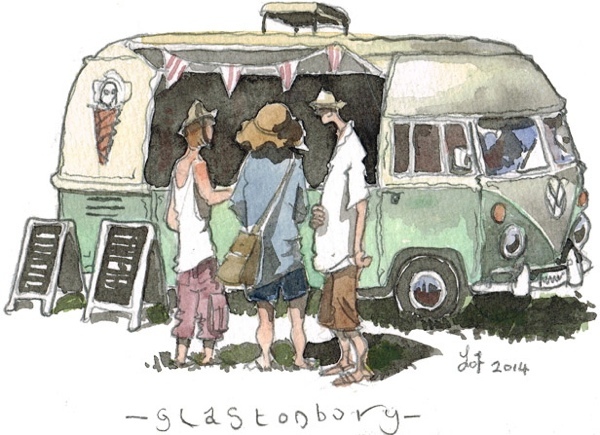 As I am fortunate enough to live in Pilton where the Glastonbury Festival is held, and living here makes it easy for me to get out with my paints and do a spot of work in between bands, larger and hog roast. I felt that this year I would take it a bit easier and just do a few small postcards for a bit of festival fun. 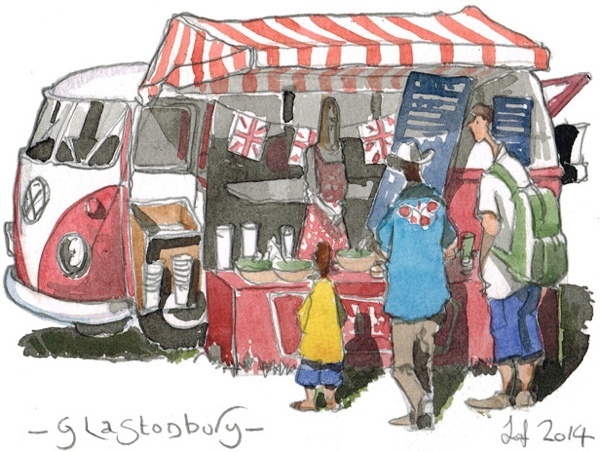 The festival occupies and few square miles, and fifty odd stages so there is a vast army of businesses on site to offer the best takeaways in all the world. 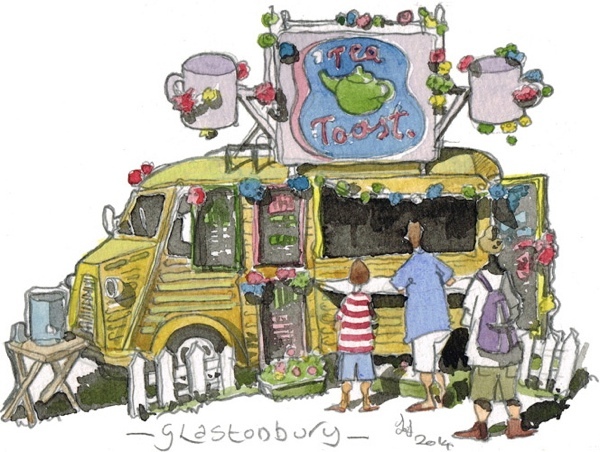 With that in mind, I decided to paint a few of the many weird and wonderful food and refreshment vans that are plying their trade. The three vans were just randomly chosen, though each I felt had a particular charm which exemplifies the festival. I had to dodge the weather on occasion, though I got what I wanted in the end. I think that it is fairly obvious at this point that I am not much of a writer. I tend to write short, choppy sentences and to be rather terse. But, I did go to this blogging course and I feel that I owe it to my fellow students to at least try. I also confess that I just wanted to meet the brilliant teacher of the course, I had no idea that I would actually have to write anything. And that it would be personal. This is my dentist. I asked him if it was okay to write a blog post about him and he said “yes.” He has been my dentist for thirty years, we started going to him because his daughter worked with my husband. Over the years, I have gotten to know him, his pets, the wildlife around his house (he lives over across the valley on the side of the mountain) and his whole family. He’s a working-class guy from Pueblo, Colorado. His father was an Italian immigrant who came to Pueblo to work in the steel mill, back when there was a steel mill. His father was long gone, but his mother lived to be a hundred. My dentist is well past the age when most people retire (his son, the dentist, just retired), but he likes his work, and he is really, really good. When he hit retirement age, he got interested in forensic dentistry and learning about new things has kept him going. He often has stories about cases that he is working on for the Coroner. He has done dental identification of corpses, and bite mark analysis in criminal cases. When I saw him last week I thought to ask him why he became a dentist. He was studying to be a doctor and working nights at a hospital while he went to school. He found it too difficult to deal with death, so he switched over to dentistry and, as I said, he is very good. The entire time he is working on you he is blathering and telling bad jokes, he must know thousands of them. Before you know it, he’s finished and everything in your mouth is working again. Having attended the most recent class, I can say it was worth it, even coming from abroad. And to see here in print thoughts that I heard voiced in class just a few months ago is so encouraging. Thank you Gentle Author for also being an encouraging, Gentle Teacher. Although I have been doing blogs for a few years and even worked in the field of online marketing I jumped at the chance to do TGA’s course. Over a few days you learn as a team to get in touch with that inner blogger to help you be more ‘you’. This was especially important to those who had never blogged yet and were looking for a good start or just a bit of confidence that a supportive team can bring. This worked very well and I met some great writers who would not describe themselves as ‘writers’. Just adding my 2 cents about the course: it was fun, intense, and scary. GA is so kind and helpful about writing, making it seem less scary, like one could really do this. If you are thinking about this course, go for it! The other students were fascinating and different, it was great to hear about people’s interests and motivations. It’s a fabulous weekend experience.